I’m a big fan of Paul Atterbury’s book, and as someone who was born after steam was abolished I think it is fascinating to be able to read about how the heritage movement was started & what it was like back then. This book features some wonderful photographs, and is A Nostalgic and fascinating book which looks at the glorious heritage of lost railway lines in Britain. The book contains archive photos which illustrate the way things used to be aswell as accounts from those who worked on the railways and photos of how the area looks now. The books also looks at the reasons why the closures were made and what became of the various structures afterwards and is a fascinating and nostalgic look back at a certain period of time, which is brought vividly to life through the means of words & photographs. Using an awesome collection of archive photographs which show how things really were & a treasure trove of memories from someone who was there and remembers it well, this is a nostalgic look at Britain’s Railways through the eyes of a chap whose boyhood dream it was to become an Engine Driver, but who was sadly denied due to medical reasons. The book also looks at the oldest named train in the world “The Irish Mail” which was famously hauled by Royal Scot locomotives for 30 years, with such wonderful machines as BR Standard Class 70000 Britannia, Pacific 6201 Princess Elizabeth, Pacific 6203 Princess Margaret Rose and BR Standard 8p 71000 Duke of Gloucester all mentioned. Awesome articulated Beyer Garratts are also featured in the book & the history and development of these amazing locomotives such as the factors that went into the design is also explained. Steaming through Snowdonia looks at the route of the Narrow Gauge Festiniog & Welsh Highland Railway from Porthmadog to Blaenau Ffestiniog through Snowdonia National Park, and looks at the motive power used such as Beyer Garratt & Fairlie Engines, including the wonderful double ended Fairlies that can often be seen working the route. This book features a selection of wonderful images from a classic colour collection of Railway photographs. which celebrates the work of the Steam Locomotive within British Railways between 1948 and 1968 and uses exclusive images selected by the former proprietor of Colour Rail, Ron White, who has worked tirelessly for the past 30 years to bring together and preserve a photographic record of Britain’s Steam Railways as they were. This volume contains colour images from all five regions of British Railways – Western Region, London Midland Region, Southern Region, North Eastern Region, and Scottish Region. and is a fascinating look at steam locomotives at work in all parts of the British Isles, with plenty of stunning photographs of many famous locomotives such as BR Standard 4-6-2 71000 Duke of Gloucester, glorious A4 Pacifics and many more besides. From the publishers of Steam Railway Magazine, and in association with Allelys Heavy Haulage, comes this invaluable guide to all the Heritage Steam railways, both full size & Narrow Gauge currently operating in Great Britain. All railways are listed alphabetically, & the address is given, with instructions & a detailed Ordnance Survey Maps showing you how to get there, by car, by rail & by bus. The Railway’s Websites are also listed, so you can have a look at the railway online before you go. There is also a useful price guide to Train Fares, aswell as a guide to the facilities at each location and advice on the best photographic locations along each route. The Locomotive Stock at each Railway is also listed, as is advice on how to go about volunteering at a steam Heritage Railway and when each line is open. This fascinating 3 DVD boxed set takes a look at Railways in Britain throughout the 20th Century. It comprises of the episodes Waterloo Sunset, Rails in the Isle of Wight and Vintage Southern. Waterloo Sunset as the title suggests concentrates on the Southern Regions last Steam worked lines from Waterloo to Salisbury & Weymouth, and features footage of Nine Elms Shed, following the main-line down to Basingstoke. Heading West to Worthing Junction and going South through Eastleigh & Southampton. There are also scenes filmed in the New Forest, including Lymington, before going south to Bournemouth and featuring the famous Channel Islands Boat Train, before reaching the destination of Weymouth. Volume Two, Rails of the Isle of Wight features vintage Steam Railway footage of the lines from Ventnor to Cowes, Brading to Bembridge and Sandown to Merstone & Newport. This is contrasted with the islands new Tube trains being tested in places such as Clapham Junction, and the story of the first generation tube trains in their all-blue livery is covered. The story is then brought up-to-date with scenes recording the Wonderful Atmosphere of the Isle of Wight Steam Railway. I’ve recently watched this really cool 3Disc DVD boxed-set again, which features The Battlefield Line, The West Somerset Railway and The Severn Valley Railway. Disc two of Steam in the 21st Century travels on the West Somerset Railway from Minehead, to Norton Fitzwarren, which is home to the awesome SDJR 88. The episode tells the convoluted history of the SVR from it’s conception to it’s eventual opening in 1862 some 20 yeas later, up until it’s closure in 1963 as a result of Dr Beeching’s recommendations, and thanks to the efforts of a number of dedicated rail enthusiasts, it’s eventual reopening again in 1970 as a Heritage Line. 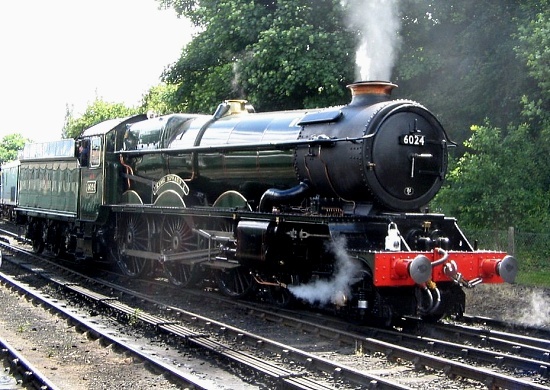 The disc also charts the progress of the reopened Heritage line from small beginnings to the highly successful & popular tourist attraction it is today, Locomotives featured in the DVD include Black 5 45110, Stanier 8f 48773, Ivatt class 2 46443, Stanier Mogul 42968 and GWR7802 Bradley Manor among many others. I really enjoyed watching this years Dr Who Christmas Special starring Katherine Jenkins & Michael Gambon. It was very poignant in parts & exciting in others. It starts when The Doctor (Matt Smith) lands on a planet similar to Earth during Victorian Times & meets a really miserable old curmudgeon named Kazran Sardick (Gambon), who can control the weather and is able to save the lives of thousands of people, including Amy (Karen Gillan) who are plummeting towards certain doom aboard a stricken spaceship, but who is unwilling to do so. So, being a Time Lord, The Doctor is able to travel back in time and find out why Sardick became the way he is, and finds a life full of sadness & tragedy, ruled by his domineering Father, and made worse by the knowledge that he will eventually lose the love of his life (Played by Katherine Jenkins) to a serious illness. The Doctor must persuade Sardick to change his ways in order to save the lives of thousands of people, with a little help from Ms Jenkins. For Christmas Santa brought me this wonderful 3 DVD Boxed-set, which features hours of footage taken around Britain’s Railways and features an impressive array of Steam Traction from around the Country. The First DVD “British Steam in the 50’s & 60’s concentrates on the last two decades of Steam Operation on Britain’s Railways and features loads of fascinating footage taken by keen amateurs recording the end of an era in Britain’s history. Part One includes steam workings at Clapham Junction and features impressive locomotives like GWR Castles & Kings. Plus an interesting look at Stanier Pacifics on the West Coast Mainline and BR Standard Classes. Part Two of this DVD features former LNER Passenger & Freight Locomotives, Wellingborough on the Midland Mainline, Bulleid Pacifics on the Southern Region and Britannia’s at Liverpool Street Station, plus many more.